Occupation: ferryman (as Bracca), true occupation unknown, warrior perhaps? Affiliations: the inhabitants of the town of Cascan are unaware of Braccas true nature. Enemies: Conan the Barbarian, the unnamed warriors that challenged it and failed. Base of Operations: a ferry along a stretch of Thunder River passing through Zingara near the fishing village of Cascan and possibly the hills of Cimmeria. Powers: The Scarlet Personage was a being that appeared to have a variety of physical abilities, but in reality, most likely conducted assaults upon its victims on a spiritual or psychic level. Victims of the Scarlet Personage battled against the creature in an illusory realm seemingly drawn from their own memories. During its dream-combat with Conan the Scarlet Personage proved to be a quick and powerful, but unskilled swordsman capable of catching and breaking the barbarians sword blade in its hand. 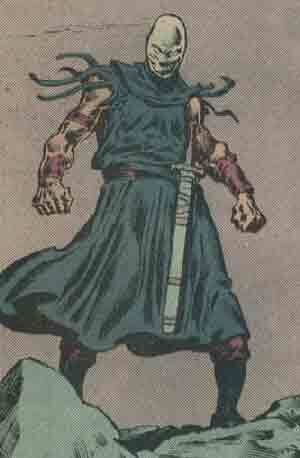 Also at the beginning of the dream-fight Conan was seemingly transported to his homeland of Cimmeria. The Scarlet Personage showed the power to draw strength from a victims horror and fear of death. It is uncertain if the Scarlet Personage could perform such feats in the waking world. In any case a victim losing their fear of death deprived it of its strength. It was said the Scarlet Personage had the power to drive a man insane if it looked upon his true face. Both the Scarlet Personage in the dream and Bracca in the waking world were shown to wear a ring set with a red stone. It is possible this ring was the source of the Scarlet Personages powers, though it could have merely been meant as the device by which Conan realized Bracca and the Scarlet Personage were one and the same. History: (Conan the Barbarian#175)- Traveling with his companions Delmurio and Tetra away from the civil war ravaging Zingara Conan arrived in the fishing village of Cascan looking for someone to ferry he and his friends down river. After a brief fight with some of the locals who blamed mercenaries like Conan for the war the trio headed to a local tavern to find a ferryman. No one would take them for any amount of money though one fisherman had his hand cut off by Tetra for suggesting an alternate method of payment. In the words of one sailor "since this wars on Death rides the Thunder River." Just as a fight was about to break out due to Tetras antics Bracca the blind ferryman showed up and to the other sailors' disgust offered Conan and company a ride. Days later and many leagues down the river from Cascan, Bracca, Conan, Delmurio, and Tetra were about a days journey from Argos. As Delmurio and Tetra slept Bracca told Conan his story. The fishermen of Cascan, once his friends and brothers, now despised him, thinking he was a spy for the eastern faction in Zingaras civil war. Bracca said their empty nets and idle days gave way to malicious suspicion. The boat the sailors had spoken of being recently attacked was none other than Braccas. His passengers were wiped out and Bracca himself was struck unconscious only to awaken and discover he was blind (and presumably horribly scarred to judge by the bandages on his face). Conan asked if he didnt fear a repeat attack and Bracca replied that he feared starvation and death enough to take his chances. A fog engulfed the boat unbeknownst to blind Bracca. Conans keen eyes pierced the mist only to discover the river flowed directly into a huge stone facade in the form of a mans howling face. The boat was pulled by the current into the open maw. Suddenly Conan was stunned to find himself in the Cimmerian wilderness in the dead of winter and separated from Bracca and his two sleeping friends. Wondering how he got there and where the furs he wore came from Conan was approached by a large party of men fleeing into the snowy wilderness. Conan asked them what land he found himself in and the white-bearded leader told Conan it was Cimmeria and he had come home to die. Conan pretty much laughed this off and the old man told him it was not he Conan must fear. Both he and Conan were victims of the Scarlet Personage! Conan was told death itself stalked the hills and that they had all found themselves whisked away from their boats upon Thunder River to face the Scarlet Personage. Each of them fought and lost and now they were condemned to wander the snowy hills for all eternity. To face the Scarlet Personage was to embrace Death! The old man told Conan to hide in a nearby village lest he share the same fate as they, but the mans son realized that the steely eyed Conan would not flee but rather stay and face the monster. Pulling his father away the young man gave Conan one piece of advice: "When the Scarlet One finds you - - and he will find you - - do not look at his face. For once youve seen his true face - - madness will come, with death swiftly to follow." Conan walked about for a bit, bellowing insults and calling the Scarlet Dog out of hiding. The Scarlet Personage obliged and appeared on a hilltop. The pair readied for battle and then leapt at each other, swords drawn. Conan taunted the masked creature saying he was fast but a poor swordsman. Conan parried its blows, reteliated, and then knocked them both down the snowy hillside. Rising first Conan prepared to deliver the coup de grace until the Scarlet Personage caught and broke his sword in his bare hand. The demon began to choke the life from Conan as the barbarian realized his mistake. He had been fighting death personified on it its own terms. In desperation Conan resolved to at least look his slayer in the eye and pulled off the Scarlet Personages mask. Crawling horror lied underneath. 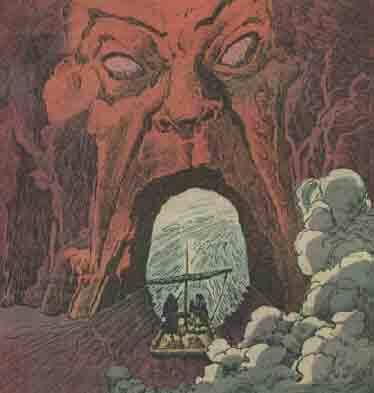 A red, rotted skull-like face with worms crawling out of its mouth and eyes stared back at Conan. "It is ultimate victory for the Scarlet Personage. For, looking upon the face of Death itself is enough to drive a man insane Conan will crumple to a weeping, screaming, insane mass, and then Death will take his life... Or will it?" Conan defiantly spat into the face of Death and the Scarlet Personage, suddenly unable to support Conans weight, recoiled and dropped him. Conans defiance sapped the strength of the creature that fed of the fear of death. Unnerved by Conans iron will the Scarlet Personage fled. For the first time in eons Death allowed a victim to escape. But escape was far from Conans mind. Conan stalked into the abandoned village where the demon attempted to hide the monsters own sword in his hand. In a series of vicious blows Conan staggered the demon. Then suddenly the Scarlet Personage was gone and Conan hacked at a set of empty clothes. "Nice sword," quoth Conan. On the floor of the hut where he had defeated Death Conan discovered the demons glowing red ring. Picking it up Conan suddenly found himself standing upon Braccas boat once more. The ferryman was in mid-sentence, telling Conan he was raving in his sleep about "fog, and snow, and death". Then Conan spied a familiar ring on Braccas finger. Unmasking Bracca Conan found himself face to face with the Scarlet Personage once more and then kicked the creature overboard. "Farewell, Bracca. Its been an interesting trip." I suppose just to spite Conan the monster churned up the peaceful sea and Tetra and Delmurio awakened to a stormed tossed boat and Conan shouting to them that he thought they are all in for a rough trip. Comments: Created by Jim Owsley (now Christopher Priest) and John Buscema. This story has all the hallmarks of a classic ghost story and is exceptionally well-written. Yet another great self-contained Conan issue. I guess barbarian heroes just arent as popular as they used to be, because I dont understand how Conan isnt still running with stories like this. There were signs all along that something was wrong on the Thunder River near Cascan. Aside from the civil war, an evil man inflicted on himself, the fishermens nets started coming up empty, then Braccas boat is attacked, and only a blinded Bracca returns. No trace of the others bodies was ever found. Were the battle and the events preceding it all in Conans mind or is there some sort of giant carven facade on Thunder River? Was Conan actually transported to Cimmeria and if so what is the Scarlet Personages connection to that land? Were the wanderers Conan spoke with actually those defeated by the Scarlet Personage or merely illusions conjured to demoralize him? Like all good ghost stories "The Scarlet Personage" has a few unanswered questions which lend it an air of mystery. I prefer that they go unanswered, but felt they were worth bringing up. It is uncertain if the Scarlet Personage tormented and killed people as it did for sport or for sustenance. 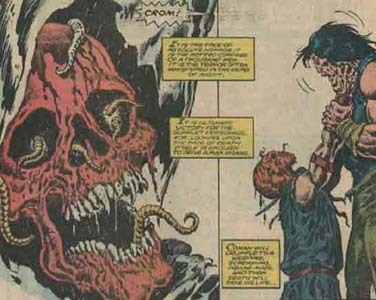 In all likelihood being undead in some fashion already the creature didnt die when Conan kicked it overboard, and it could even have been responsible for the incessant storms plaguing the city of Argos in the next issue CTB #176. Tetra and Delmurio, like any good battle hardened travelling companions of a prehistoric barbarian, slept through the entire battle with the demon until Conan kicked it overboard and the seas started getting a little rough. Bracca the Ferryman most likely died in the Scarlet Personages first attack upon Thunder River. If this blind imposter had trouble seeing it was because he had worms where his eyes should be under those bandages. It suited the Scarlet Personages purposes to pose as Bracca in order to lure further victims to the lonely stretch of Thunder River, days away from Cascan, where it conducted its sorcerous attacks.